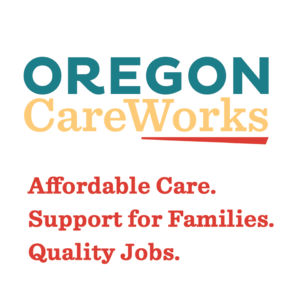 Family Forward Oregon | Check out Oregon CareWorks! Family Forward Oregon launched a joint project today called Oregon CareWorks and released a new report on Oregon’s care economy. The report, Oregon’s Care Economy: The Case for Public Care Investment, outlines problems with the current caregiving system, such as rising costs and low wages, and provides evidence of the high economic returns to public care investments. Accessing care for children, seniors and people with disabilities places enormous financial stress on many families in Oregon. For example, an average single-parent household in Oregon would need to spend 51 percent of its income to pay for infant care. Demand for care in Oregon is large and growing. 70,000 people work in caregiving jobs in Oregon. However, the average care worker earns just $20,000 per year. Investments in care can create good jobs that will boost Oregon’s economy. Caregiving jobs are among the fastest growing profession in Oregon. These jobs cannot be outsourced or automated. On the other end of the care economy, access to care allows parents and family members to stay in their own jobs rather than leave the workforce to care for their loved ones. There is a wealth of research showing that care investments can promote equity, generate stronger economic growth, and strengthen families and communities. For example, the return on a public investment in 3 hours a day of universal pre-K care for 4 year olds is estimated to be nearly 7 percent annually. New Report on Paid Family & Medical Leave! Sick Days Update: Oregon Senate Passes Bill, On to the House! PREVIOUS POST: « Welcome Kate, Our New Policy Director!